Another week, another sending off for Leeds United and another defeat as they went down to a 1-0 loss at Ipswich. Thomas Christiansen’s men, showing nine changes from the side that crashed out of the FA Cup in embarrassing style the week before, were playing well enough and looking comfortable until eight minutes before half-time when midfielder Eunan O’Kane was given a straight red card after clashing with Jonas Knudsen. There did not seem much contact, but the Irish international was adjudged to have deliberately made contact with the home player with either a headbutt or elbow and now seems likely to be banned for three games at the same time as Samuel Saiz sits out his six-match ban for spitting at Newport. Ipswich went on to win with the only goal of the game coming courtesy of a long range strike by Bersant Celina, their on-loan player from Manchester City. Leeds had chances even with 10 men with Liam Cooper missing the best of them, but failed to score for the third Sky Bet Championship game in a row and are now outside the play-off places. Little happened early on before Leeds had the first good chance on 20 minutes as good play by Pablo Hernandez set up Pawel Cibicki, but the Swedish wide man was unable to take advantage. Ipswich’s first chance came soon after as David McGoldrick’s cross found Joe Garner at the far post only for the striker to volley narrowly wide. United were appearing to get on top as the half was progressing despite having to make a change with Cibicki limping off, to be replaced by Hadi Sacko. They fashioned another decent opening when Kemar Roofe raced through only to be denied as his shot was blocked by Luke Chambers. The momentum switched, however, after O’Kane was red carded and Leeds were lucky to go in at the break still all square with Martyn Waghorn’s corner hitting the post and Celina smashing an effort against the woodwork. Ipswich came close again early in the second half as Callum Connolly’s shot was saved by Felix Wiedwald. The keeper was beaten in the 68th minute when Celina worked himself into space to curl a shot into the net from at least 25 yards out. It proved the only goal of the contest, although United did keep going and should have equalised as Hernandez’s great cross found Cooper in the box, but the centre-back smashed the ball over a gaping goal. Substitute Pierre-Michael Lasogga had one last chance only to see his powerful shot saved by home keeper Dean Gerken. 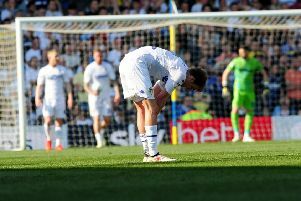 Leeds head coach Christiansen was disappointed with the O’Kane sending off, which proved key in the match. He said: “I hope the club will appeal. There’s no evidence that he goes to him, he just faced him and there’s a contact. Christiansen said he was proud of his players’ efforts. He added: “I was happy with the response. “At the half time my message was the same, we want to take the three points and we believed in that. “That was the spirit of the team, fighting the last 48 minutes of the second half, but was not enough, every played did what they had and for me there is no complaining. “If we play 11 against 11, we win for sure. “I am proud of the players, everyone can see we did not to deserve to lose this game. Ipswich: Gerken; Iorfa, Chambers, Knudsen, Kenlock; Connolly, Skuse (Hyam 76); McGoldrick, Waghorn, Celina, Garner. Leeds: Wiedwald, Berardi, Jansson, Cooper, Anita (Lasogga 78), Phillips, O’Kane, Cibicki (Sacko 29), Hernandez, Alioski (Shaughnessy 45), Roofe.